People continuously try to communicate with celebrities and other important people on Twitter but don’t really have much of a plan or structure. 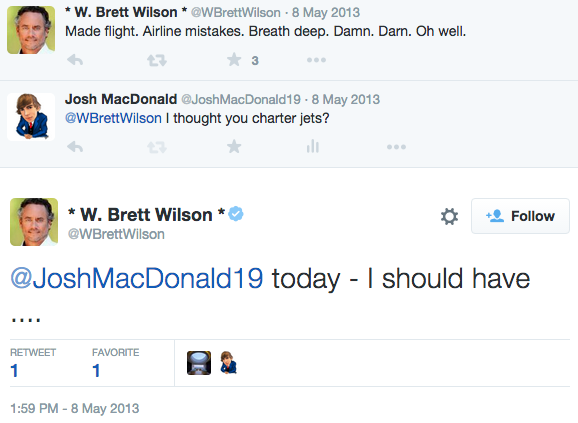 Here’s how I break down each tweet I write, and how I am able to communicate with the best. 1. Make sure they see your tweet. What time are they using on Twitter? Most important people, especially business icons are on a tight and structured daily schedule, and Twitter will find it’s way into it each and every day. Check their tweet history to see when they are normally online. Are they normally active at 7:30 AM every morning? Are the tweets sent them automated or are they actually on their phone? Many sharks on the TV show, Shark Tank, schedule their tweets and 95% of people don’t realize this and still respond to the celebrity’s tweets. What time do they usually get tweeted by other? If 10,000 other people are tweeting your target because some news related to them just got released, your chances of getting seen are slim. For example, Kevin O’Leary would get the most tweets during and after an airing for Shark Tank, so don’t try then. 2. Make sure they want to respond. Offensive remarks will make them want to respond, but that probably isn’t in your agenda and won’t help your cause. Ask a question that embeds and shows that you already know about them. Show that you’re not some guy trying to make a quick buck off them. “How are you today?” is kind of plain and generic. No one ever responds to that question with any attention span or interest. 3. Make sure there is something to respond to. Ask a question that would make them want to respond. Something that isn’t a hard or inconvenient to answer. Many people tweet statements, like “hahaha that’s funny” to a tweet that a celebrity sent out. What do you expect back from that, a happy face emoji? Take a look at some of the tweets and responses below to give you some idea. I see it too many times, someone starts a blog talking about beginner basics that have literally been talked about and written on hundreds of times. Most bloggers need to start offering something beyond what they think their audience is capable of knowing. You need to establish your credibility and knowledge by talking about topics that are pushing their intellectual capabilities. If you want people to link to you, you’re going to have to start offering unique knowledge and content. People don’t want to read about how to blow dry their hair, but they want to know how to blow dry their hair with a round brush. Instead of setting up WordPress, people want to know how to customize WordPress to do XYZ. It’s not that they don’t need help with the simple stuff, it’s that there are already a ton of articles on the beginner stuff and trying to get that traffic is useless. Your traffic would also not be as targeted and passionate, making them less valuable to you. If you’re offering truly valuable insight, which my favourite type would be infographic data, then you’re going to earn links. Picture yourself as a college student sitting down for your first lecture of a class. If you understand what the professor is talking about entirely, do you think you’ll come back to the next class? Will you think the professor is intelligent and knowledgable on the topic? I don’t know about you, but I wouldn’t come back. However, if the professor was talking over my head most of the time, I’m going to come back to the class, because I need to learn this stuff, and my professor seems to know everything about it. He established himself as a credible source. If you’re an expert in an industry, you are used to the feeling of knowing more than your listener. You’re used to explaining your internet company to your 75 year old grandma or explaining how to drive standard to your 16 year old daughter. However your blog readers are already interested in your industry and your blog isn’t the first blog that they read. 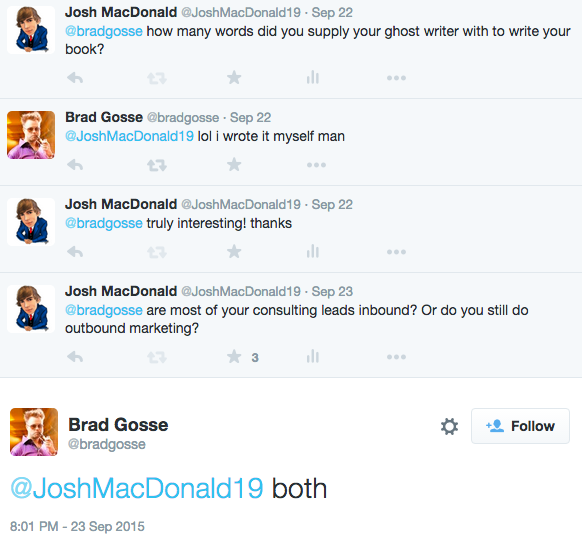 Chances are, this is not the first blog in your industry that your reader has checked out. They’ve been on similar blogs and they are holding the standard of quality pretty high. This is especially true if your initial readers are friends who are also experts in your industry, who already know as much about you, or more about certain parts. If you can keep them interested in what you’re saying and keep their attention, they are going share your blog with their following and fellow friends. They simply are not going to recommend a blog who doesn’t offer some sort of awesome value and insight. Making money online is by no ways easy. Everyone wants to do it. Nobody wants to get up at 7 am, and go work for someone else in a cubicle for 5 days a week. Kids realize this early in their teenage years and because of this, most internet markers are under the age of 25, but most of them hardly make any money. These kids put in tons of hours every week, but have almost nothing to show for it. Meanwhile, a 3o or 40 year internet marketer with a full time job will sit down after dinner every night, build a large enough income online to quit his full time job. What is it that separates these 2 types of people? Is it their maturity, their experience or their work ethic? Neither. When working just 3 hours a day, your time sitting at the computer becoming so concentratedly productive, that you get in the same amount of work as a jobless 18 year old who sites at the computer 8-14 hours a day. You begin to value your time and know that you need to get your work done now, because you won’t have time later. These older people then build a small income working just weeknights and weekends and realize that if they scaled exactly what they are doing to 8 hours a day, they could make a better living than they do at their day job. They stabilize a small, working system and scale it by spending more time on it. Teenagers will spend the entire day on the computer from day one, and bounce from method to method, trying to find a way to make money. Older people have no time to ditch what they are working on and the progress they’ve made to go start something new while teenagers don’t even think twice because they know they have a full day worth of time to work on this new idea tomorrow. They don’t realize that their schedule-less teenage days will soon come to an end. Also teenagers have no planning, as they never step back from the computer and look at the big picture. This is why so many entrepreneurs start their day so early, but still don’t start work until 8 am or 9 like most people. They start their day thinking about their plans, the big picture and close it the same way, reflecting on how far along their plans and schedule they made it. Did they make enough progress today? At some point, you have to sit back and reflect on your work and plan for the next work session. Some entrepreneur use a pen and paper beside their bed to plan and reflect. By working a little less, and planning a little more, teenage entrepreneurs could achieve more in a shorter amount of time. Checking that your website uses proper W3C markup is something that is often missed by rookie SEOs. I find it a simple stepping stone that everyone can do to ensure that Google’s crawler can read and understand all of your HTML clearly. Professionals like Neil Patel ensure that their markup follows W3C international standards. Every so often, Google adds more on site factors that influence your rankings. Using a tool like WooRank, you’ll be sure that you’re always on top of the latest advances. WooRank checks basic factors like title, headings and description but also advanced factors like SSL, mobile friendliness and social signals. 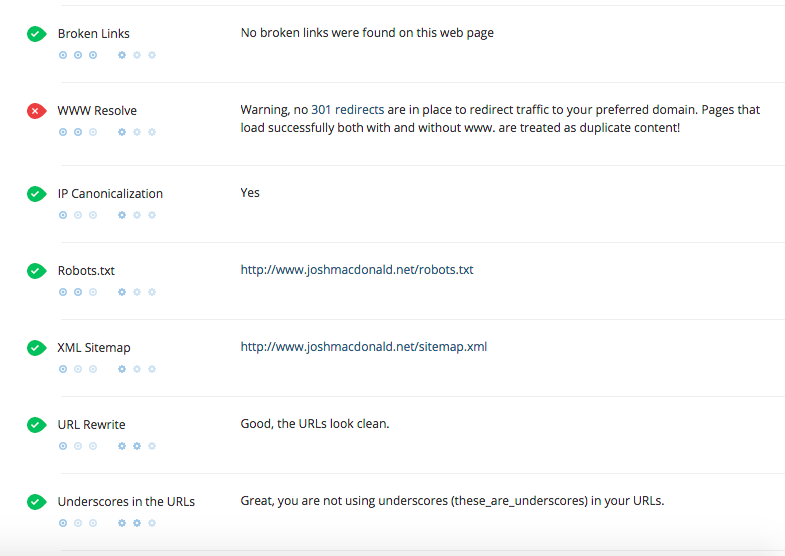 GWT was probably the first SEO audit tool you’ve ever used and if you’re like me, you check it once for each new site and never check it again. I recently checked my GWT panel and to my surprise, I found that there were a couple of errors including no dates or authors on blog posts, along with a large pile of 404s from old blog posts and pages that I deleted. I quickly resolved all the errors to put my site back in perfect standing. This is probably one of my favorite tools. 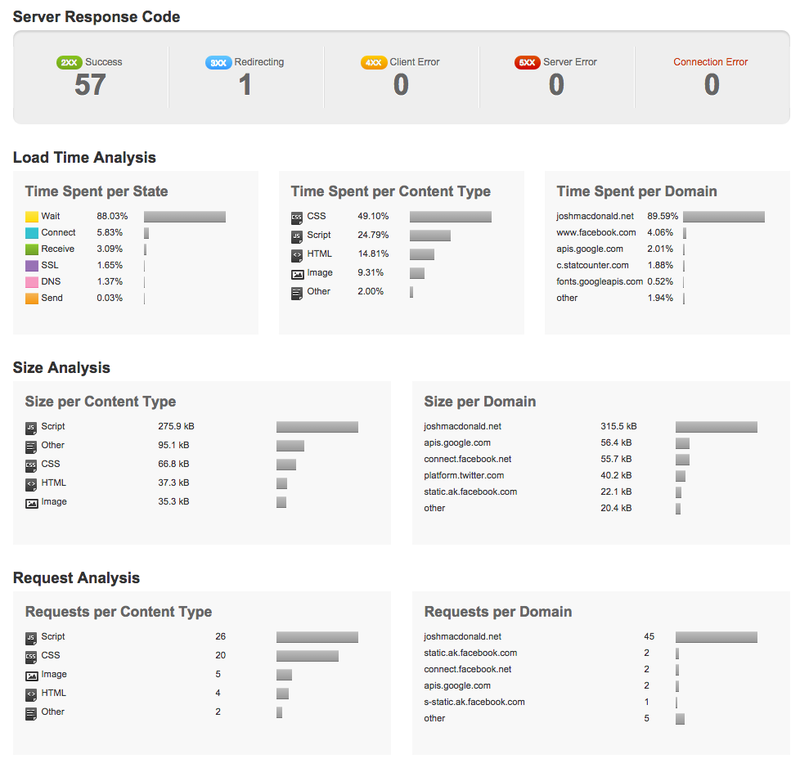 Nothing checks your website speed like Pingdom’s tool. It specifically shows you each element, how fast it loads and then it goes over what you can do to make it load faster, such as caching. Below you can see the scores I get for each aspect of speed improvements. You can see the performance grade, load time, page size and how long each element takes to load. 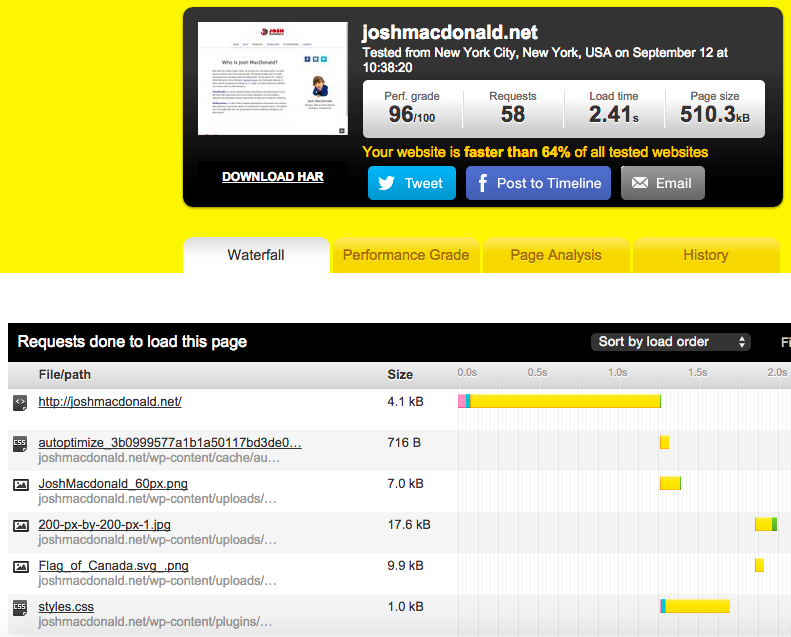 Pingdom also shows each type of media/content and how it affects your load performance. Pingdom breaks down the load time into different categories so you can pinpoint the issue that’s causing your website to load slower. Like WooRank, SEO Expositor is an SEO auditing software. It checks over your SEO approach for both on-site and off-site factors. The tool builds a multi-paged report that can be printed out for future reference. The main difference between this and WooRank is the amount of factors that SEO Expositor checks for and the bonus features it offers in your reports. It checks your SERP rankings, so that if you built a report for a client, you wouldn’t have to use another software to check the current rankings. Best of all, I own it! SnapNames.com – Charged $69 but you only pay if they win the domain for you. You must order by 1:45 PM EST. If there are multiple bids, there will be a 3 day private auction held amongst those who backordered the domain with SnapNames. GoDaddy.com – Only powerful if the domain expiring is with Godaddy (which can be checked using a whois lookup like www.who.is). They only charge $20, but refunds can only be used to place more backorders (credit). NameJet.com – $59 with similar rules to SnapNames. There is a 12:00 PM EST cut off and there will be a 3 day private auction if multiple people backorder the domain through NameJet. Dynadot.com – $15 with cut off 12:45 PM EST. 3 day private auction too. Name.com – $49 but they refund you if they don’t get it. One backorder per domain, so there will be no auction. DomainMonster.com – $65 after they get the domain. Pool.com – $60 once they get it. SnapNames, NameJet and Pool are the top 3 best domain drop catching services. The following data is 100% fresh and gathered entirely by my crawlers. Cite my website before use. 74% of first page Google results have the keyword in the URL. 83% of first page Google results have the keyword in the title. 49% of first page Google results have the keyword as the first word in the title. 82% of first page Google results have the keyword in the description. 23% of first page Google results are the index/root of the website. 54% of first page Google results have the keyword in the title. 49% of first page Google results have the keyword in the description. 31% of first page Google results have the keyword as the first words in the title. 19% of first page Google results are the index/root of the website. 35% of first page Google results have the keyword in the title. 28% of first page Google results have the keyword in the description. 21% of first page Google results have the keyword as the first words in the title. 15% of first page Google results are the index/root of the website. 46% of all first page Google results mention the keyword once in the title. 34% of all first page Google results mention the keyword once in the description. 3% of all first page Google results mention the keyword more than once in the title. 10% of all first page Google results mention the keyword more than once in the description. 95% of first page Google results have 4 or more words in the title. 82% of first page Google results have 6 or more words in the title. 60% of first page Google results have 8 or more words in the title. 34% of first page Google results have 10 or more words in the title. 19% of first page Google results have beyond the maximum title character count. 60% of first page Google results have beyond the maximum description character count. 55% of first page Google index page results appear within the top 5. 35% of first page Google index page results appear within the top 3. 14% of first page Google index page results appear in the #1 position. 23% of #1 position Google results are index/root page of the website. 78% of #1 position Google results are .com domains. Read more. 56% of #1 position Google results use at least one hyphen (-) in the title. 25% of #1 position Google results use at least one vertical bar (|) in the title. According to oDesk (now called Upwork) I currently have made 154 hires on their platform. Double that number to count for the hires outside of oDesk, on other platforms like Elance, Freelancer and forums. While I don’t claim to be an expert at hiring freelancer, I’m going to share some of my thoughts about the websites I’ve used to hire freelancers and why I like each one. The biggest website is oDesk, which was founded in 2003. I’ve used this platform the most. It is very straight forward. This platform has a lot of spam applications. Basically, you will post a job and a bunch of freelancers will apply, without reading your posting, and they’ll just paste a cover letter. There are ways of dealing with this, like using Google Forms to qualify their interest. oDesk also has their own survey system built in but I like the capabilities of the Google Forms. Many of your applicants will not even respond because by the time they’ve finished spamming, they’ve lost track of all the jobs and what they’ve applied to. oDesk is planning to limit the number of applications that can be submitted per day, after Elance found success in doing that. oDesk recently renamed themselves as Upwork, likely to rebrand and remove all of the negativity surrounding their brand. Elance is the sister company of oDesk and was founded in 1999. I tried their platform in the past but never stuck with it. Recently I tried it again after getting sick of the spam on oDesk and I’m starting to like it. Freelancers are limited the number of applications they can submit per day. This causes freelancers to take a quality over quantity approach to job application. Many will read and understand the job before applying. This is a big winner for me because I usually post complex jobs and I’m very particular the way something is made, especially when it comes to coding. With Elance you generally get a smaller amount of applications but they are higher quality. However, that doesn’t mean some coding jobs don’t get 15 or 20 applicants. While I have not used Freelancer in a while and I did use it consistently for a few months, I think much of their platform is based on gamification. Your account starts at level 1 and as you have more activity, you gain experience which levels your account up. You can win rewards at higher levels which is kind of cool. I think the highest reward was a call with the CEO. That is kind of cool but I don’t really have any reason to talk to the CEO. While I am really enjoying Elance, I still post to oDesk. The amount of responses that a data entry post on oDesk gets is overwhelming. You can find qualified data entry workers for $2/hour, and lots of them. I’ve had some jobs gets over 50 applications. However when it comes to a project that I am allocating a larger amount of time, effort and money into, I like to post on Elance because they give so many metrics about the freelancers. My favorite metric is likely the percentage of clients that rehire the freelancer. If a freelancer has done 20 jobs in the past 12 months and most of them were rehires from previous clients, I have a strong feeling that that freelancer is hard working, honest and knowledgable. I’ve sold hundreds of expired domains to all sorts of private blog network builders in all industries. I notice many newbies fall in the trap of metrics, thinking that they should be trusted for all aspects. While Moz’s Domain Authority and Majestic’s Trust Flow are very helpful metrics, there are a number of other factors to consider. I talked to Moz about their metrics to determine their accuracy on expired domains. They told me, once a domain is expired, the page authority will be set to 1 and the domain authority will depreciate a few points here and there until it’s at zero. This means a domain with good backlinks, will eventually end up with a domain authority of 1. While Ahrefs has the biggest and most accurate database, their metric is rarely used and people usually use the metrics from Moz or Majestic which almost always have found less of your backlinks. If you could incorporate all of your backlinks to get a score, their metrics could be considered more dependable. Majestic’s TrustFlow accounts for spam the best of all metrics, while Moz’s Domain Authority can simply be manipulated by blasting high amounts of spam as tier 2 do follow links. 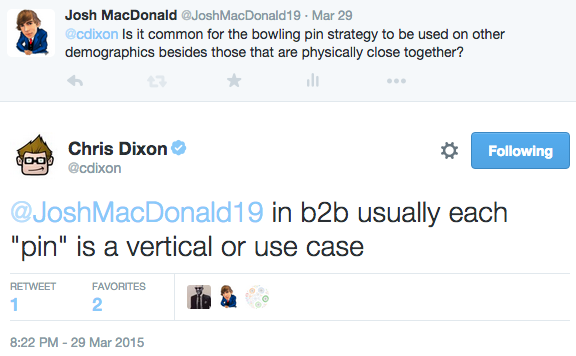 When should you use metrics? Metrics should be used when comparing a massive amount of domains and you want to do a quick and dirty search through a heap of domains. Metrics can help you trim many domains that are believed to be weak from your list, but the accuracy will never beat a manual inspection of the backlinks a site has. I’ve seen domains with a do-follow contextual link from a Forbes article have a domain authority and trust flow of 1. While automation is great, in SEO over the past few years, we have begun to notice that automated methods such as automated blog commenting is not as valuable as manually inspecting each blog and writing a unique, engaging blog comment. We should also use manual methods to sort through domains. It doesn’t matter how you look at it, specialty coffee is a waste of money. Which is why I wonder, why does arguably one of the brokest first world demographics, the student, waste so much money on it? Kevin O’Leary has said it before, and I’m going to break it down by the numbers. Suppose 5 days a week, you buy Starbucks, averaging $5 a day, or $25 a week. You do this throughout the school year, which is about 34 weeks a year. This ends up being about $850. $850 might not sound like a whole lot initially, but once you calculate this for 4-5 years of schooling, and then add the interest you could have made if you decided to put it into a retirement fund. Suppose you invested this $3400 into a S&P 500 index fund which averages a return year-over-year of about 10.5%. If you let your $3400 in Starbucks money ride in that fund for a few decade, the rewards could be quite worthwhile. Adam’s book talks in detail about Google Analytics and local SEO, including how to get a Google Places listing which is important if you’re a small business. This book is shorter than the other 2 and is probably best for beginners who want a light introduction. This book would serve best for a business owner looking to educate himself and tweak his website and digital approach. Dr William’s book discusses a number of types of backlink types, instead of bushing all of the types of link types under the carpet which is very common. He breaks SEO into 4 parts: quality content, site organization, authority, and the visitor. This book is best for an IT professional who does web design for a living and wants to get a deep understanding of how SEO is and has been understood for years. Silvia’s book goes into some of the my favourite tips and tactics for link building including using infographics to generate attention and using HARO to get the attention of reporters. This book is more for the aggressive entrepreneur looking to do whatever it takes to see massive results and experiment with new things. As always, books are not the only source of knowledge, remember to check the Google Webmasters YouTube channel for latest answers by head of webspam at Google, Matt Cutts.